•	Recruit Widely: Develop a rigorous vetting process. Well before the search begins, make certain that potential internal candidates have had an opportunity to demonstrate management acumen. If an internal candidate is less qualified than an external one, don’t let the decision be swayed by the fact that the internal candidate would be less costly to employ. •	Understanding The Partnership: The need for the CEO and Board to operate within a partnership framework is well documented and accepted. However, the CEO is both the senior staff manager and a de facto representative of the board-staff relationship. Normal communications to the staff must be through the CEO. The CEO can’t be an insecure manager by withholding negative information from the board. •	In terms of organization and CEO measurement, the board must seek data and information on outcomes and impacts, not details on processes. •	Nobody Does His/Her Job Perfectly: The board needs to be highly tolerant of inconsequential CEO mistakes. However, if these mistakes persist over time, the board needs to assess reasons for their continuing. Major errors need immediate investigation, and the board also must be honest with itself about its culpability in its due diligence process in related to the error. •	The CEO And Staff Must Be Evaluated Fairly: In a nonprofit situation, this must be done in partnership, not hierarchically. Everybody must understand the “rules of the game.” Outcomes and impacts need to be related to the mission of the organization. •	The Board and CEO Must Partner On Fundraising: An effective CEO must, in the 21st century, be the face of the organization to accomplish its mission. Nonprofit directors are part-time stewards. Consequently the CEO must accept a significant responsibility for fundraising. 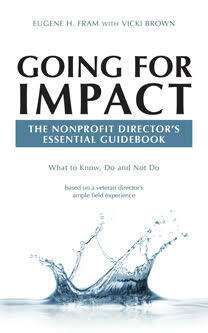 These guidelines can be useful to nonprofit boards in self-evaluation projects. They can determine whether or not the board is facing the realities of standing back and letting the CEO manage. The CEO should have full operational authority, and the staff should function without an atmosphere of board micromanagement. Although I definitely agree with Dr. Fram’s assessment of the Board’s most important job, and appreciate the reminder that it refrain from micromanaging, one cautionary note. Sometimes an inexperienced or over-burdened Board can step back too far. By neglecting -or perhaps not understanding- its vital role in providing supervision of the ED/CEO, an organization can veer from its mission or lose the cohesion and support of staff and volunteers. By providing ongoing support to the CEO, ensuring his or her ongoing visibility and accountability, the Board is fulfilling its important role as the managers of the organization. A culture in which the CEO is not being supervised and not receiving regular feedback subverts the nonprofit Board/staff structure. Serving on a nonprofit Board is a huge responsibility with serious fiscal and legal implications. The Board is vested with organizational oversight precisely because it has the collective knowledge, experience, and commitment to the mission to do so. Failing to understand and step fully into that aspect of Board service can create instability and vulnerability within even the most well-established organizations. I strongly agree with your statement. On a semantic level, I prefer to use the word overview instead of supervise. In my opinion, the word supervise can lead the board to micromanage. There is no question that a CEO left to her/his own devises, can results in significant problems. What is required is over-viewing the operation continually and then having a robust assessment annually. Thanks for your comment. When your organization is mature with a well developed or developing infrastructure I agree. During a start up and early growth phase, it is all hands on deck. I call this an operating board phase. As a nonprofit consultant, I find that this article a very good overview of critical board roles in providing due diligence. Too many nonprofit boards don’t realize their culpability for CEO performance. Appropriate oversight will provide for proper monitoring and fully understanding organizational issues. It’s a partnership! To be successful, I think it has to be a partnership, not a parent-child relationship. CEO’s come and go, as do Board members. To me, a critical role of the board is to look forward five, ten, and more years to ensure the organization and mission is sustainable and growing. If you have a competent CEO, you should spend a minimal amount of time in the detail of the current operation. As governance has evolved over the years, since the major meltdowns (Enron, etc.) a decade ago, leading governance practice has tended to merge the protocols for all boards. This is a good trend. Public companies have improved governance practice now their private company and not-for-profit counterparts are following suit. I’d recommend that Board members of not-for-profits attend development programs targeted at public companies. The learning curve would be higher than programs specialized for the not-for-profit world. I agree. At the risk of sounding commercial, those interested might want to glance at the recent edition of my book: Policy vs Paper Clips:How using the corporate model makes a nonprofit board more efficient and effective. In my experience, the problem starts at the recruitment stage — many new board members don’t grasp the serious responsibility they are accepting. A clearly-worded role description and scope of responsibilities agreement should be signed by new Board members before they join. Good idea. However, it is important to remind directors of theses responsibilities when they don’t follow through. At that point, many shy away from what is necessary because it creates conflicts. Thanks for you comment. This post continues a theme developed by Dayton in 1987 in a paper entitled Governance is Governance which encourages board members not to meddle in the management of the non profit. sound advice. Without quibbling about what is `most` important I would say that attention to legal compliance and financial control – expertise that may be in greater supply on a board than with staff – is also important. The development of Policies – HR, Conflict of Interest, Salary etc – are also crucial areas of board contribution. Sure the CEO will recommend them. But if they require board approval, the board should be implicated in the final product. I`ve seen Salary Policy mandate ‘guaranteed’ salary increases. These are not minor issues. Lastly Boards are responsible for thinking through the optimal relationship between boards and managers and between members and boards; a governance architecture that is key to ensuring accountability and more broadly, mission success. I`ve seen grant making agencies threaten to pull funding (thank goodness) because bylaws were changed to limit Membership to members of the board. I`ve seen Managers try to change bylaws to limit Membership to themselves. Where`s the accountability? Thinking a board can simply pick and manage the `right’ CEO and then switch to auto pilot can get boards and companies in trouble.